Overall, Pure Body Naturals Slimming Hot Cream fell flat in my opinion. I ended up giving it 1/5 stars. It’s suggested to be a skin toning, slimming, anti-cellulite, and deep muscle relaxer. Unfortunately, I got none of these effects from it. I didn’t like the application process. This gel starts out being cold and wet and then starts to tingle and burn. The tingling/burning sensation feels good for a short while, then I found it to be incredibly obnoxious and uncomfortable. It was hard to go about my day, especially having to do it twice daily. The tingling sensation lasted so long… up to a few hours some days. And you’re not supposed to shower afterwards because it could make it worse. It also has a very strong peppermint/menthol smell that isn’t pleasant. After all that work, I didn’t even see any short term or long term results. So the whole thing was a disappointment. 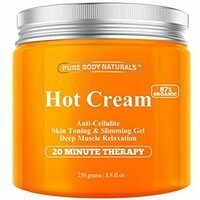 Pure Body Naturals Slimming Hot Cream is a gooey-like, orange colored gel. It’s definitely pretty watery and slick to the touch. I’m really not a fan of this application process. The gel itself goes on fairly easily, but it’s in a jar. I don’t like jars because I feel really unsanitary dipping my fingers into it after each application. For the instructions, you’re going to apply the gel to your problem areas, 2x per day. It starts off very cold and wet and then starts to tingle and burn as it soaks into your skin. It felt good momentarily and then was just completely obnoxious as I tried to put clothes on and get ready. It also suggests wrapping the area with a cover to help get better results. I tried doing this and it was literally a “hot mess”! It made the burning so much more intense and it wasn’t fun. Be sure to wash your hands immediately after applying and don’t get it anywhere near your eyes, nose, ears, or mouth. A few times I was applying the gel for too long and my palms started burning and got really irritated. It took about 15-20 minutes for this gel to dry. BUT it leaves you feeling very wet and sticky. The tingling sensation lasts for a ridiculous 1 to 2+ hours. This product has a very strong peppermint, medicinal smell in the jar. It can definitely give you a headache, especially if you’re more sensitive to smells like menthol. Once you’re done applying the gel, the menthol, peppermint scent lingers with you for hours afterwards. It’s not fun walking around smelling like a Peppermint Pattie. I wasn’t a fan of this. The short term results were pretty nonexistent. I noticed just slightly softer skin. However, it was nothing to get excited about. 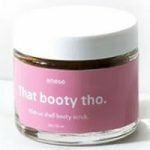 After trying this cellulite product for a while, I was very disappointed from the lack of results. I saw zero improvement in the appearance of my cellulite. No cellulite product is going to miraculously take away all of your cellulite, however, there are products that definitely improve and minimize it. Unfortunately, this product isn’t one of them. It also says it works as a muscle relaxer and to sooth sore muscles. I tried this product a few times after some intense leg workouts (that left me oh so sore) and it felt good on my legs for a little but virtually no help with the soreness and tension. So, it failed in all areas for me. Pure Body Naturals Slimming Hot Cream has a great number of natural ingredients. It’s also 87% organic, which is a perk. Menthol is thought to stimulate the circulation of blood and may help tighten the skin. Pink grapefruit contains a great deal of bromelain, which is an anti-inflammatory enzyme that supposedly aids in the break down of cellulite. Another useful ingredient is Aloe Vera because it’s suggested to decrease inflammation and improve hydration and the suppleness of skin. Cinnamon and Rosemary are rich in beneficial antioxidants and may help firm the skin. Witch Hazel is also thought to tighten the skin and help reduce the appearance of cellulite. One 8.8 oz bottle costs $14.95 on their website. That ends up working out to be $1.69 per ounce. That’s so affordable for a cellulite product. This is definitely one of the lowest prices I’ve seen. Pure Body Naturals has a really great satisfaction guarantee. They offer a 60-day, 100% money back guarantee. If at any point you aren’t completely happy with your product, just email their customer service department and they will get you set up for a return and then refund you the full amount. I really appreciate when companies offer their customers guarantees like this! To buy Pure Body Naturals Slimming Hot Cream, click here.